We are soooo proud to announce our SUPERHERO of the month for August, Mary Swain! For many years, Mary thought of exercise as torture and only worked out to keep her weight stable and her diabetes in-check. 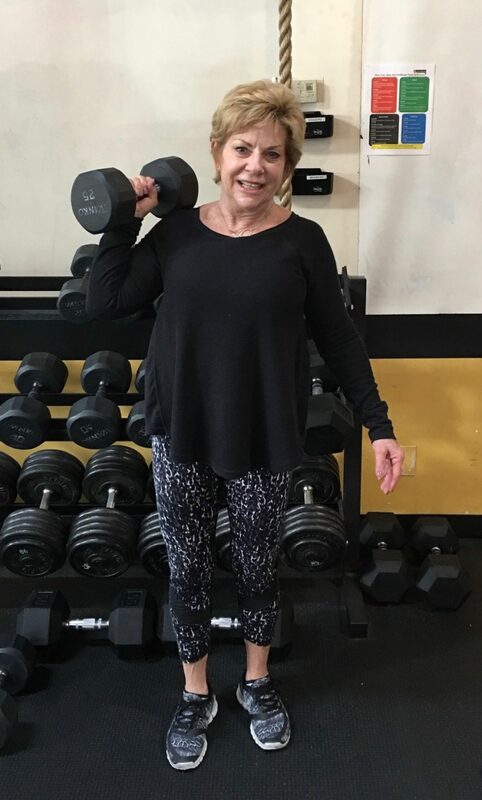 She never thought of fitness as fun until she tried a weightlifting class at Mo-Mentum. Soon after she began incorporating other classes like spin and metabolic mash-up to her routine. Not only did she gain strength and lose fat, she loved the challenges that came with lifting weights. Now the gym is her happy place. She has a great group of fit friends and she is mentally and physically stronger than she was a year ago. Thank you for being our superhero of the month Mary; you are truly a Superhero! Meet Mary Swain, Mo-Mentum Fitness’s superhero of August! She is definitely a superhero! Mary is a spitfire! She is a bright light in every class she takes because she loves to laugh and make us all laugh. Mary is an inspiration on every level. From showing up even on the days she “doesn’t feel like it,” to supporting her friends in transforming their lives by being their most dedicated cheer leader. They say to find people in your life who are living their lives the way you’d like to live your life. When you find those people do what they do! Mary is one of those people for me. She is an inspiration, she’s FULL OF ENERGY, laughs, and love. She’s active and caring and living her life to the absolute fullest! Mary is an absolute gem and a gift to have as part of our Mo-Mentum Tribe! Read on and get inspired! Before I joined a gym my life was chasing around three active kids. I was a stay at home mom and was fortunate enough to be able to volunteer at the schools. I was able to be a team mom for my kids soccer and basketball teams. My life and my health was good and then along came my 40th birthday. Slowly, I started putting on some weight and became increasingly unhappy with the way I felt and with my appearance. There was a low point in my personal life that changed everything. However, I prefer not to go into detail about that time. I gained more weight and became a Type 2 diabetic. This low point lasted for a few years. But one day, I was able to see the “silver lining of the situation.” I had wonderful friends as a support system. I made some new friends along the way. For that, I am grateful. I bought my first pair of walking shoes when I was pregnant with my daughter who was born in 1990. I started working with a personal trainer 3 times a week in 1993. Since then I have always exercised whether it be at a gym, outside walking, or bowling. The results I have seen are more mental than physical although I know I am stronger physically than many women my age. I love it when I can see a muscle in my bicep! My arms still need a lot of work but there definitely is a muscle! The biggest change I’ve noticed is how I think about exercise. I used to dread it. It was like torture. Now it has become a habit and I miss it when I don’t go! I love being sore! I have lost some weight, but not a lot. I don’t think about the number on the scale like I used to. I still weigh everyday but I no longer let that number determine my mood for the day. I know I have way more endurance than ever before. The biggest change for me, is I could not imagine my life without exercise being involved. I still take medication for diabetes but my numbers are always in the pre-diabetic range. To me, that’s a win! AND, I just received the results of my blood work done this past week. My A1c (average of blood glucose for 3 months) is 5.2. 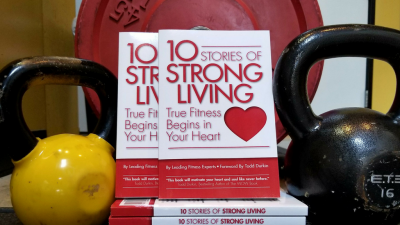 In the beginning, I made fitness a priority in my life because of my mid-life weight gain. Then it was a priority because of the diabetic health benefit. Now, it is a priority because I love it! Mostly, I love working out at Mo-Mentum Fitness with the people I am working out with. It is consistently a tough workout but OHHH SO MUCH FUN! These days having my family happy and healthy makes me happy! I feel completely at peace spending time with my granddaughter who is almost 5 years old. She lives in Montana and I am fortunate enough to travel there a few times a year. She is adorable! I feel stronger mentally and physically than I did a year ago. I feel happier than I have in a long time. However, that is not the best part……….the best part is I love being at the gym. It is my happy place! I am now 65 years old. I’ve been married to my husband, Eric, for 30 years this December. He is a self-employed, brick mason. I have three grown children and one grandchild.